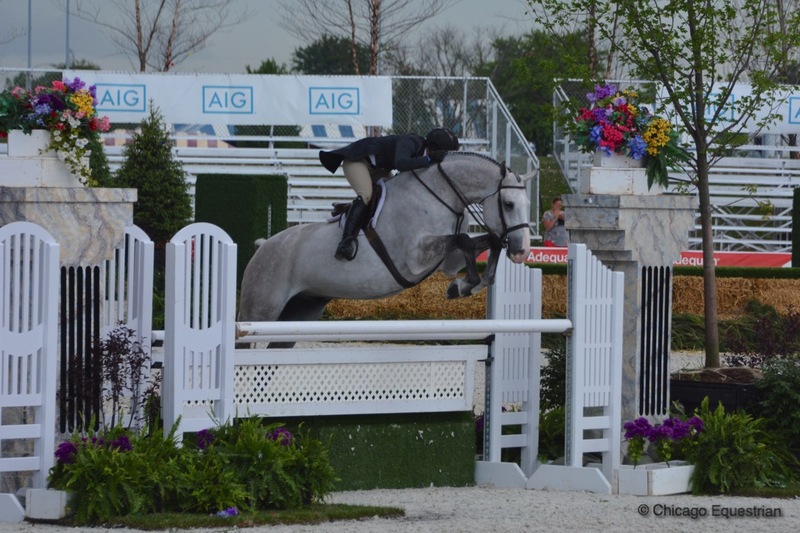 Meagan Murray-Tenuta rode Becky Price's Cheeky to win the $10,000 USHJA National Hunter Derby at the Showplace Productions' Derby Day with Molly McAdow of Galway Farm presenting with new Buena Vista assistant Sana Abbas. Wadsworth, IL – July 6, 2017 - Buena Vista Farm and Meagan Murray-Tenuta welcome Sana Abbas as assistant trainer to the team. Buena Vista will keep Abbas busy helping with numerous sale horses, lessons, assisting at the horse shows and managing the farm. Abbas has been in the tack since she was two years old and started competing at age 6. Since then, she has successfully ridden and shown in hunter/jumper, saddle-seat, dressage, western and foxhunting disciplines. During her junior years, she had many working student opportunities to learn all the industry aspects. She actively competes, participates in clinics, instructs, trains and sells horses; applying everything learned from the multiple disciplines she has experienced. Abbas (pictured right) is currently working towards her USHJA Trainers Certificate, course designing and judging certifications. Abbas is sponsored by Antarès Sellier France and GhoDho Equestrian Breeches. Her first stop with Buena Vista was HITS Balmoral Park for the Showplace Spring Spectacular Show, which showed Abbas what she was up for as Murray-Tenuta collected top ribbons. On Derby Day, trainer Murray-Tenuta won the $10,000 USHJA National Hunter Derby on Becky Price’s Cheeky. Cheeky is a six-year-old, Westphalian stallion and placed second in the $2,500 USHJA National Hunter Derby during Showplace Spring Spectacular II. 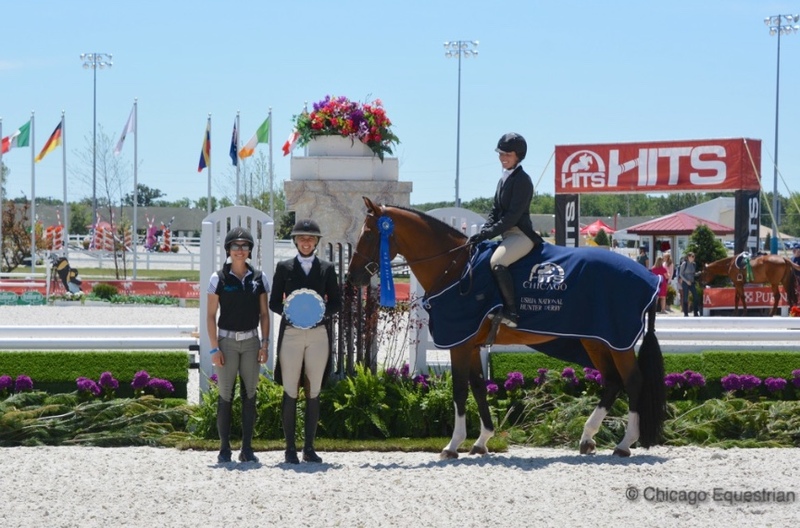 Murray-Tenuta placed fourth in the $25,000 USHJA International Hunter Derby on Price’s Editorial, a 10-year-old Holsteiner, who won the first round of the prestigious Deeridge Hunter Derby this winter in Wellington, Florida, among numerous championships in the hunter divisions. Jetson was champion in the Non-Thoroughbred Hunters during weeks II and III with Murray-Tenuta in the irons and Logic, owned by Price, was reserve champion in Young Hunters both weeks as well. Jetson is an example of the quality horses you can find for sale at Buena Vista Farm. Beau Reve, owned by Hadley Bahr, was Reserve Champion in the Green Hunters 3’3” during week III with Murray-Tenuta aboard. Customer Cathy Rolfs was Champion Low Amateur Jumper week II on her Coco Chanelle. 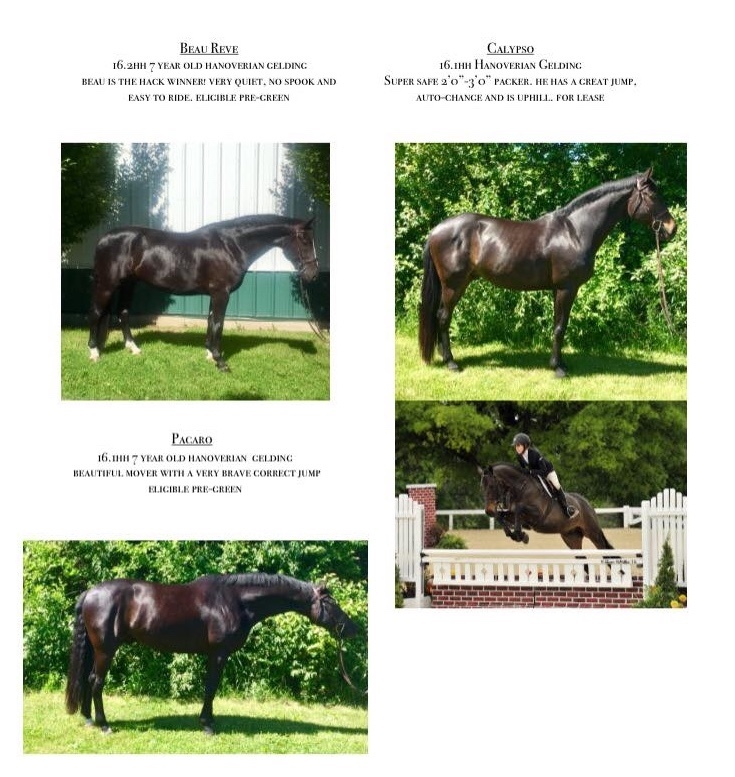 Buena Vista Farm also has a large selection of quality horses for sale. Contact them to try your next champion. 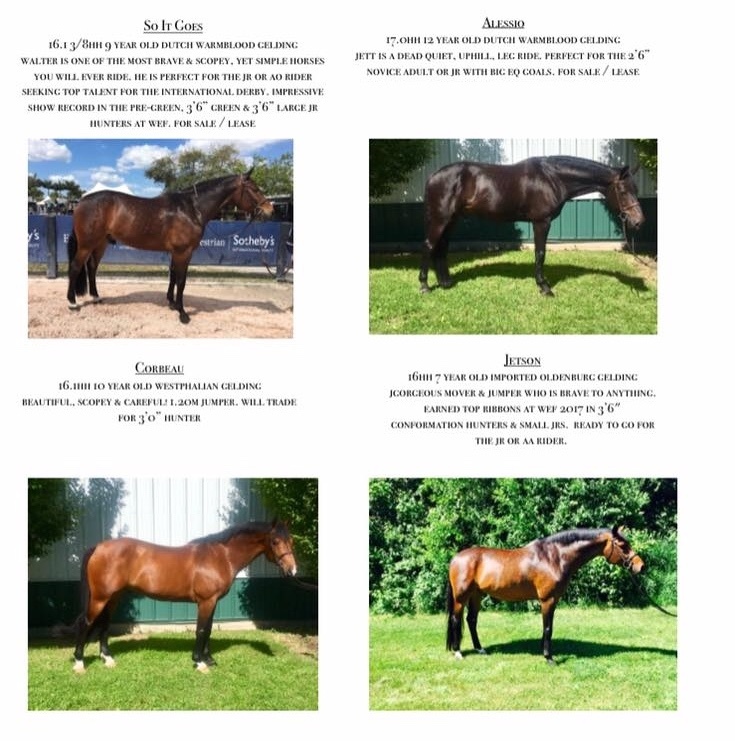 For more information on Buena Vista Farm, visit their website at www.buenavistaequine.com or contact Meagan Murray-Tenuta at meaganmurray@comcast.net. 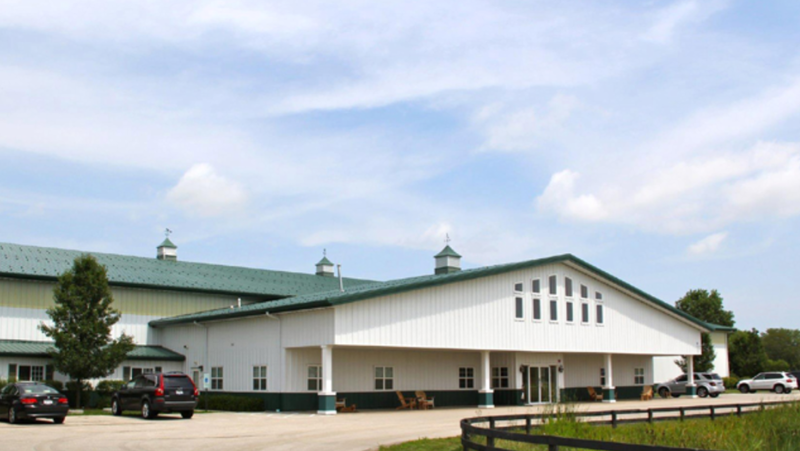 Buena Vista Farm is a full service hunter/jumper training and boarding facility in Zion, Illinois. The state of the art facility has high-end amenities to satisfy both horse and rider.